Whether you’re a staunch Remainer, a buccaneering Brexiteer, or are wavering between the two camps, you’ll want to be fully au fait with all the issues surrounding Britain’s exit from the EU—wherever in the world you and your business are based. This book, by leading businessman and entrepreneur Nicholas Wallwork, will arm you with everything you need to negotiate the post-Brexit landscape and end up just where you need to be. 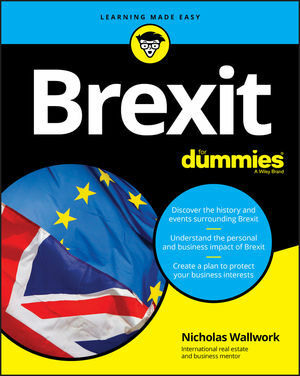 Kicking off with the history behind the tightly fought June 23 referendum, Brexit for Dummies covers the origins of British Euroscepticism right up to the most recent legal and policy changes in place following the vote. As well as looking at the influence Brexit has already had—both domestically and internationally—the book takes a glimpse at what lies ahead, giving you vital insights into how to protect your business right now and to capitalize on new opportunities in the future. Think global: how is Brexit influencing the international economy? Get moving: what do immigration policy changes mean for my business? Love it or loathe it, Brexit has profound implications for your business, and this guide will help you stop worrying and prove that au revoir doesn’t mean goodbye for good.